The first time I went back to beginners classes was when I was training to be a teacher – at the time I was working full time and had a child at junior school, so Sunday morning practice often got abandoned, and so my “rescue” plan was Andrew’s Sunday night class. I quickly realized that I had missed a lot when I first studied yoga and so not only did I get the practice I was seeking, but I got a lot of information I hadn’t been ready to hear first time around. As a trainee teacher, it’s incredibly helpful to reconnect to what the start of the yoga journey should be like – it’s so easy when you’re training intensively and working with other trainees to lose sight of who you will be teaching. How you teach new students, how you don’t adjust physically, how you have to work on your communication skills – is all learnt by either being in a Beginners class or by “helping” out. And it’s easy to forget it once you’re qualified too! When you do home practice or teach the sequencing of the practice is a real challenge. You have to understand how to break asanas down and how to approach them. If you don’t know how to get started, I got a top tip from Angie one day, which was to write down the sequence I’d just done with Jayne, and then practice it. Might seem blindingly obvious to some of you, but it wasn’t to me! There are lots of sequences out there to follow and I’m attaching a couple of links to USA practice plans which are a little shorter than Guruji’s sequences in the Dorling Kindsley book. The main thing I tell my students is to start. Standing in Tadasana while the kettle boils for your morning brew counts as practice. Don’t aim for an hour – aim for 5 minutes. When you help out in class you see some of the magic of the subject of yoga – you see the change in people’s energy from before class to the end of class – we’ve all experienced it for ourselves, and to see students in Savasana after class the first time, you realise what a huge responsibility you’ve taken on and what big footsteps you’re attempting to follow. And finally we all have moments when we think – what am I doing, why am I doing this yoga thing? When doubt assails us, or grief or life overwhelms us, I would always recommend a beginners class, as it brings us back to our yoga roots and grounds us firmly again. 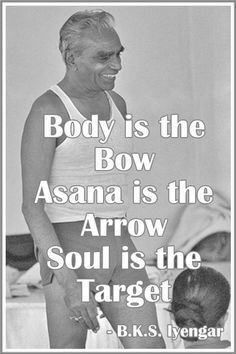 BKS Iyengar said “I am a Beginner” – there’s always so much more to learn and we can study with that mindset in any class, but a beginners class brings me back to that. The following was written by Anna Locke and published on brumyodo.org.uk/news/death-over-yoga/ Thank you to Anna for sharing her knowledge and experience with us and for allowing us to share the post. 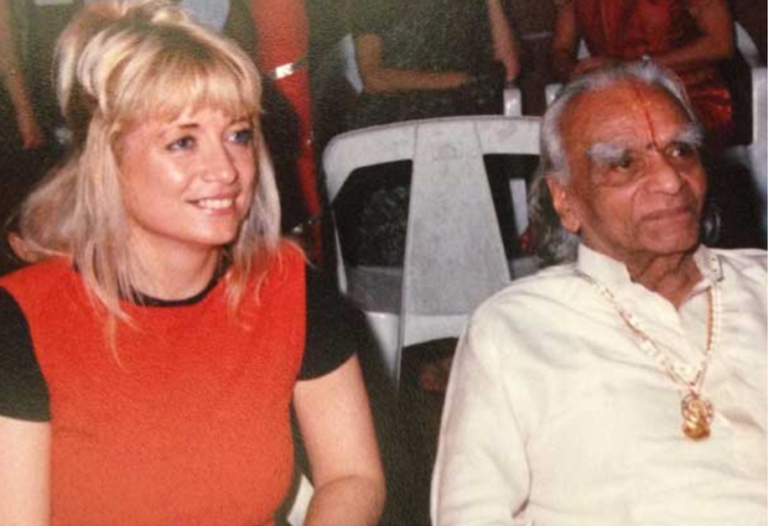 Jayne Orton, an advanced yoga teacher (pictured above with B.K.S. Iyengar) and co-director of the Birmingham Iyengar Yoga Institute in Acock’s Green, and BrumYODO member Anna Lock recently co-hosted a yoga philosophy evening for yoga students to explore how death in a modern, medicalised society and the yogic philosophy intertwine. A kind of yoga orientated Death Café. Contemplation of death within yoga practice has a long history. The father of Yoga Patanjali in the 5th century B.C. India wrote the Yoga Sutras which informed the development of the many diverse branches of yoga. Jayne singled out a Sutra which chimes with modern attitude to death and shows how death is recognised within yoga philosophy to be a deep rooted fear: ‘ the fear of death is strong in everyone – even the wise’. During the session there was exploration of how for yoga practitioners during a class their own mortality can be highlighted as a challenging pose takes them away from everyday concerns and into the present moment, or explicitly during the final pose of a practice ‘Savasana’ otherwise known as corpse pose is a vivid reminder of our shared destiny. Long standing students described observing through yoga practice their physical and mental changes as they age, which allowed a deeper understanding of their bodies and to then make adjustments to live life as well as possible whilst understanding that change is inevitable. They reflected on the role of faith and cultural attitudes to death and dying through time, drawing on Anna’s professional life as a palliative care doctor and BrumYODO member, as well as individual’s own experiences of loss and their hopes for future conversations with people they love. and happiness. If one is already free from that complexity, death comes naturally and smoothly. If you live holistically at every moment, as yoga teaches, even the ego is annihilated, I will not say. “ Die before you die”. I would rather say “Live before you die, so that death is also a lively celebration”.